And the one below I just cannot remember. I cannot pick a favorite...just love their bright colors. Not much going on here. Roger finished cutting the wood from the tree. We saved some of it to have a bonfire some evening if we want. I planted a few more Asiatic lilies...I have gradually grown to really love them. I am not sure what I am going to do where the crab apple tree grew. Maybe nothing this summer. I told Roger now I can look out the front window and watch for rainbows. Always before I had to go outside to see around the tree. The cats did not know what to think yesterday...I am thinking they will miss it. They like to climb the bushes when we are outside watching them. I never notice them up them unless we are out there. They are like a kid showing off. OH MY GOODNESS!!!! These are outstanding, I would not be able to choose a favorite one. The last one has those lines and ruffly frills all over, and such a delicate color, the intense color on the other ones, wow!!! We had a huge beloved maple tree in our front yard that got sick and had to be cut down, it was really sad, one reason we bought this house was seeing that tree before even the house and loving it...anyway,one good thing was once it was gone I had a better view and so much more light came into the living room! They are beautiful Rose! The purple and yellow color combo is my favorite. Wishing Roger success in his turkey hunt. We haven't seen the bunch that came by here for a few weeks. We only have a lone hen who comes to eat under the bird feeders every day. We think she may be nesting close by. Oh, how pretty! We have some the same color as the top one that have just bloomed. I was out there taking pics of it yesterday. Yours are gorgeous! 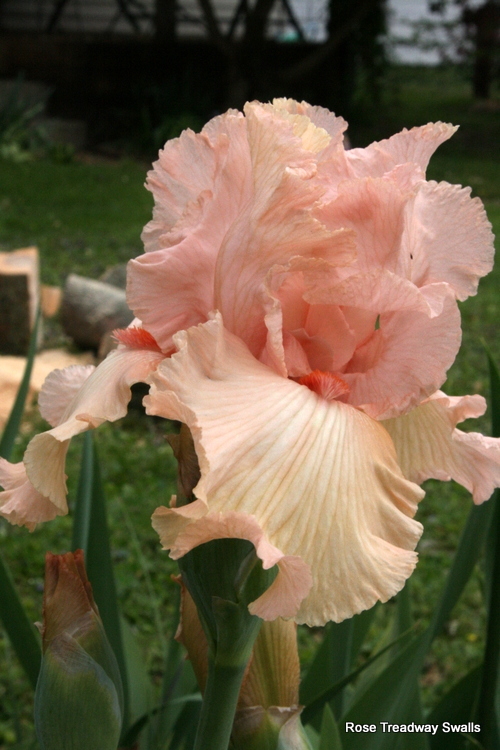 Those iris's are gorgeous! I love all the colors! Hopefully your husband will get a turkey. did you remove the stump? i saw an oake tree yesteray that they carved the stump into a sculpture and put poly urthene on it. yes i did get a picture of it and it will appear. i am back forgot to comment on the flowers. the purple is my favorite because of the clarity of the photo but the others are just as pretty. Oh these are wonderful blooms, no wonder you like them!! Beautiful colours. 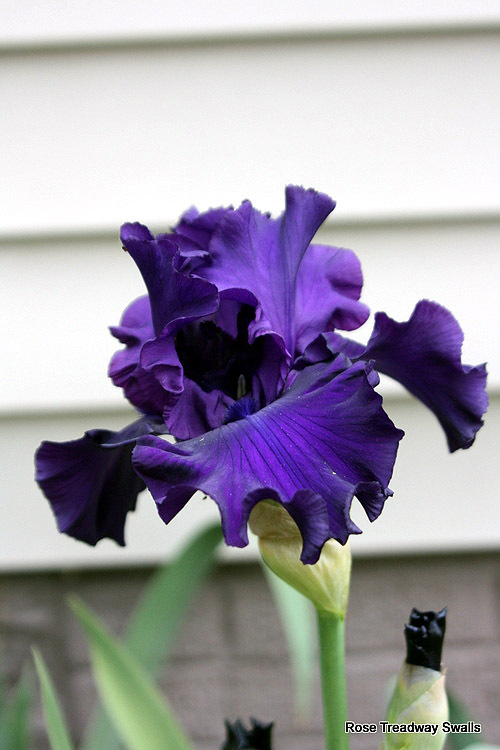 Gorgeous Iris'. I do not have a one at my new house. Had tons at former house. Kinda' sad. just gorgeous, you are so much further ahead of us, can't even see any buds on ours yet. 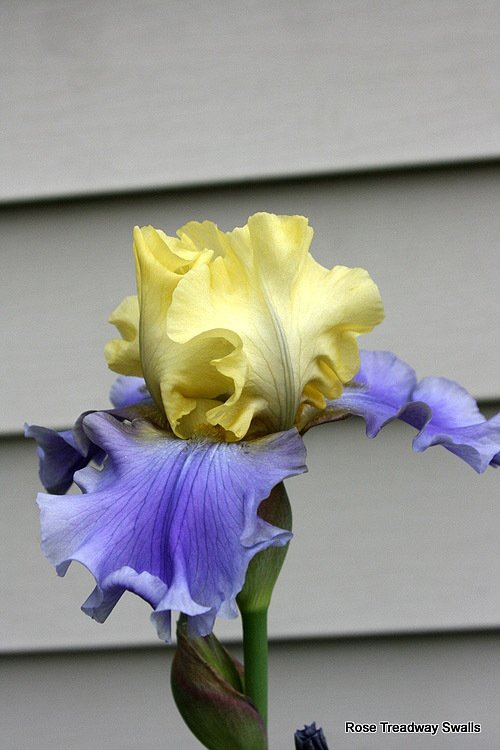 I love iris of all colors...beautiful!